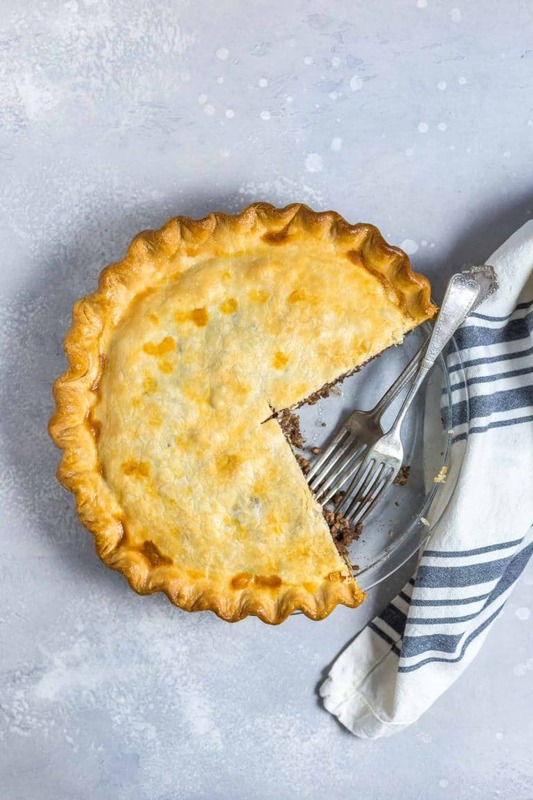 Originating in Quebec, Tourtiere is a traditional French Canadian Christmas recipe. 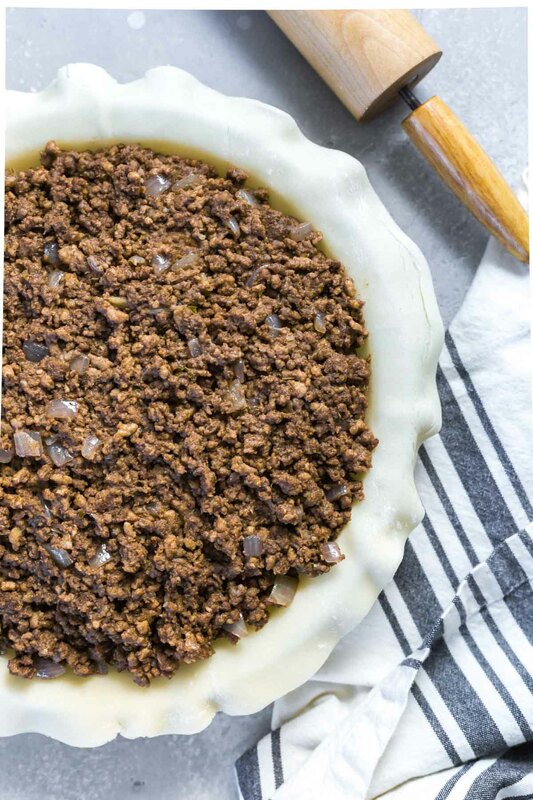 Learn how to make this Canadian meat pie with flaky crust and hearty, spiced filling, just in time for the holidays. Makes 1 pie or 8 servings. Some of you may already know this, but my husband is Canadian. Since we’ve been together, I have learned a whole new set of traditions, especially when it comes to food and holidays, but Marc’s favorite holiday tradition is tourtière (mine is vin chaud and shrimp with cocktail sauce). I can’t remember when I first had it, but I think it was when we were living in France and one of his teammates from Quebec hosted holiday dinner, but I could mistaken. Either way, I knew it was for me a my first bite. 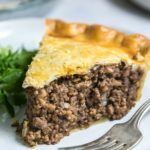 What is the spice in tourtiere? It was hearty, and it was spiced with some of my favorite flavors. It reminded me so much of my favorite Irish sausages and Cincinnati chili, and that’s because the key spices are cloves, all-spice and cinnamon. 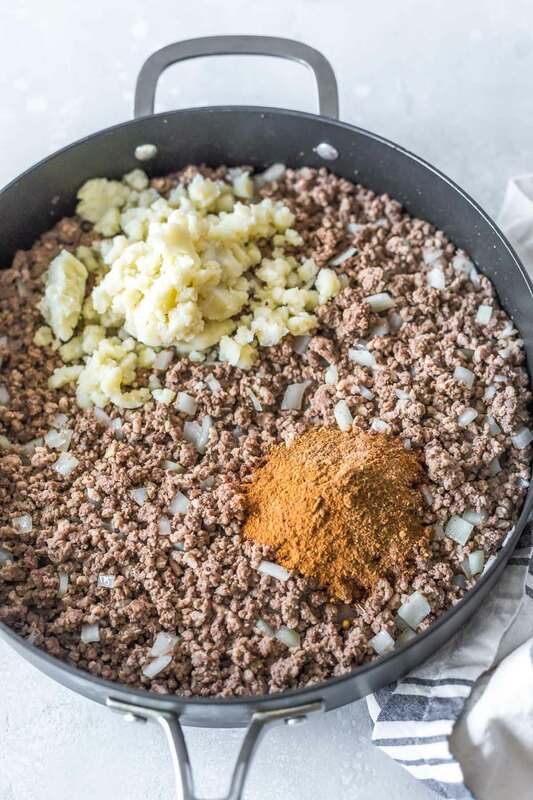 There are other spices in there, too, but if you’re looking to pinpoint what gives this Canadian meat pie it’s unique flavor, that’s undoubtedly it. How do you make Tourtiere? Prepare your pie crust. As always, I’m using store bought crust for this Canadian meat pie. Most store bought brands are already dairy free, and you know how I feel about taking shortcuts when I can. We already have enough extra work in our lives. 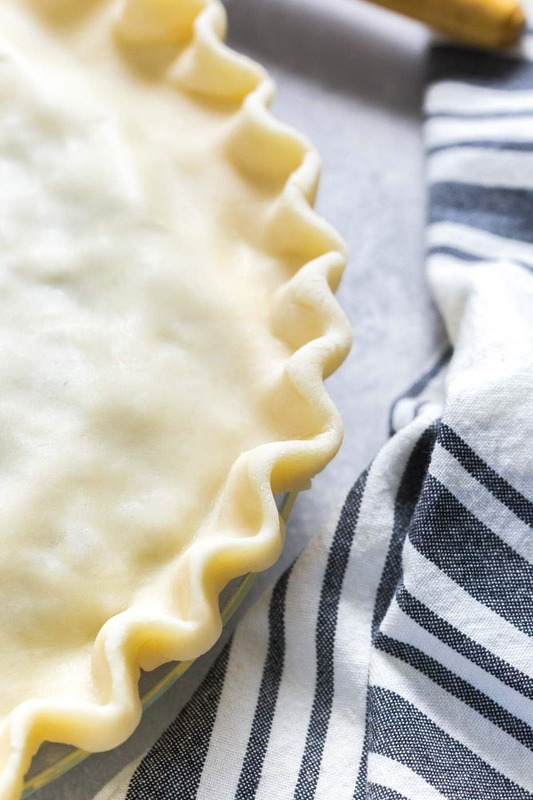 However, if you have a homemade pie crust recipe that you love, definitely use it. You’ll need two pie crusts. Mash some potatoes. This recipe calls for 1 cup of mashed potatoes. You can either use leftover mashed potato, or you can boil some peel potatoes and mash them. No need to add anything to them. Get them smooth, and they will work just fine. 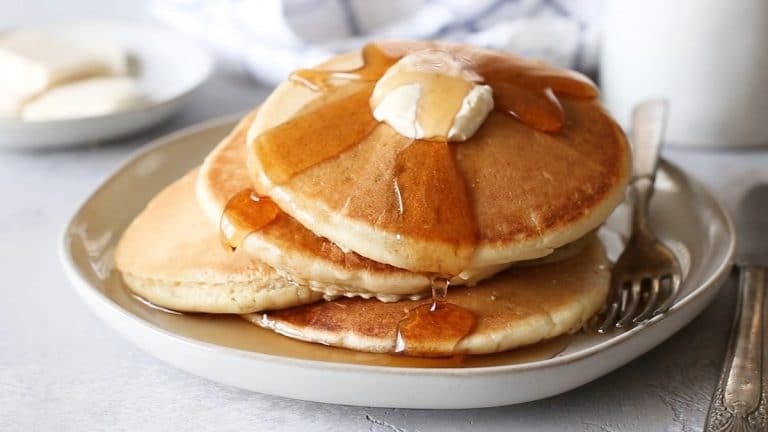 Make the filling. In a large skillet, heat some olive oil to medium high. Add your onion, and sauté until it’s translucent and slightly soft. Then add your beef and pork, and let it brown. Break up the meat into small pieces as it cooks. When it’s no longer pink, add the mashed potato and spices. In a small bowl, whisk together the beef broth and flour together (you can also shake it in a jar or container). Pour that into the pan and mix everything until the potato has dissolved into filling and your broth has thickened. Adjust seasoning with salt & pepper, to taste. Fill the pie. Line your pie plate with the bottom crust. 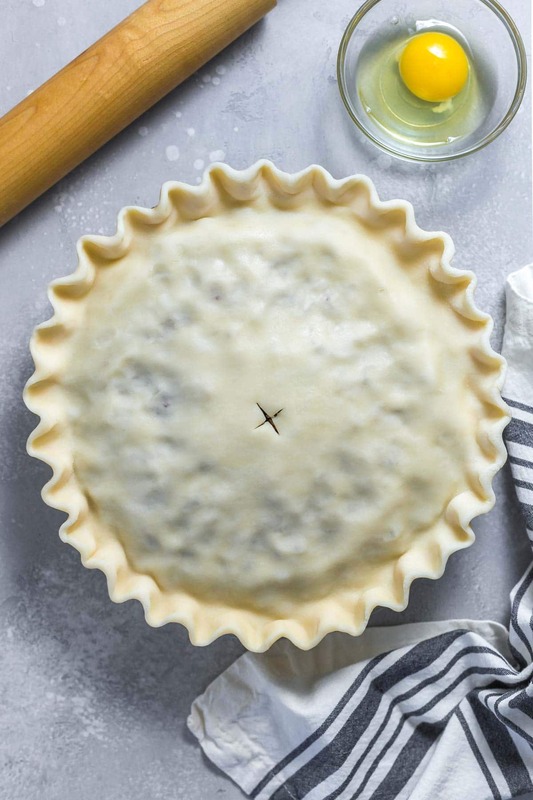 Transfer your filling to the pie plate and top it with your second crust. Carefully fold the edges and press together to seal them, and create a vent in the top crust – piece with a fork, cut out a shape, whatever you prefer. Brush the top with a quick egg wash before baking. Bake your tourtiére. Place your meat pie in a 375˚F oven and bake for 45 – 50 minutes. The crust should be nice and golden brown when you remove it. Let the pie rest and allow it to cool for at least 10 minutes before serving. We normally have our tourtiere on Christmas eve, which is when most people in Quebec have their big Christmas meal. Since my family normally has a bit of an Italian seafood spread (shrimp, mussels, fish cakes), I usually bring this as my contribution because it’s something a little different. Tourtière would also be a great option on New Year’s Eve, if you’re not ready to change up your Christmas traditions. Since this meat pie is such a hearty dish, it’s nice to balance it out with something a little lighter. It’s traditionally served with pickled red beets, chili sauce, or even ketchup, but I’ve never done it that way. When we aren’t having this as part of a Christmas even spread (or if this was our main dish for Christmas), I like to serve my tourtiere with my favorite kale and Brussels sprout salad. A fresh arugula salad would work really well, too. 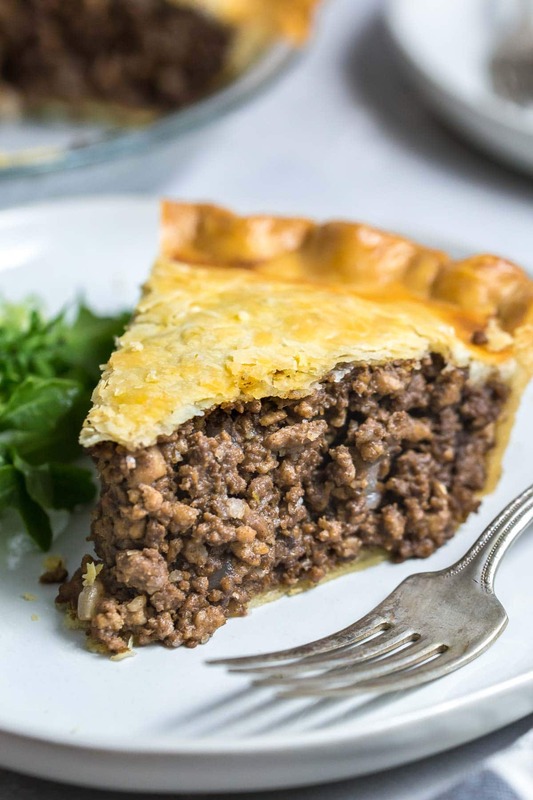 Originating in Quebec, Tourtiere is a traditional French Canadian Christmas recipe. 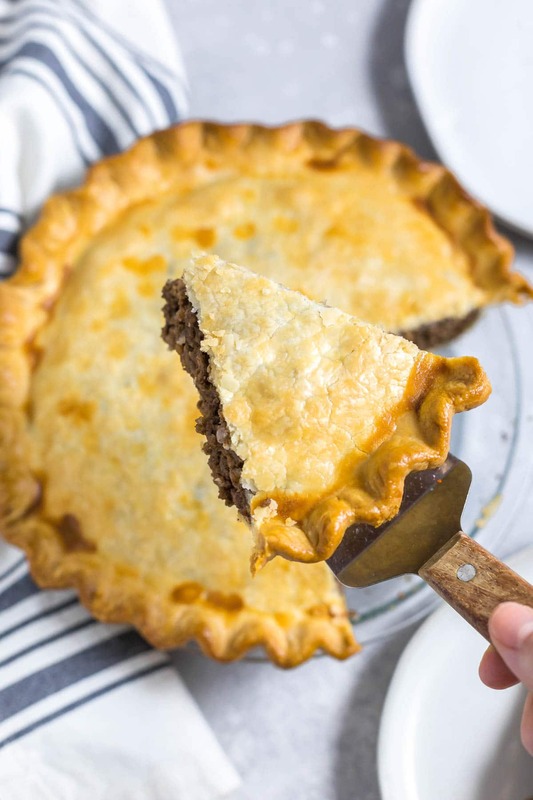 Learn how to make this meat pie with flaky crust and hearty filling, just in time for the holidays. Heat a large skillet to medium high. Add the oil and onions, and sauté until translucent. Add garlic and continue cooking until fragrant, about 1 minute. Add ground beef and pork and cook until no longer pink, breaking up the meat into small pieces. Add mashed potatoes and spices. In a small jar or container, shake beef broth and flour until smooth and pour into the skillet. Cook until the broth has thickened. Place the bottom crust in a 9-inch pie plate. Fill the crust with meat filling and top with remaining pie crust. Seal the two crusts together, rolling to one over the other if needed, and press gently with a fork or fingers. Brush the top crust with egg wash.
Bake for 45 – 50 minutes or until the pie crust is golden brown in color. For this recipe you can use leftover mashed potatoes, or boil 2 peeled, medium potatoes until tender and mash them until smooth with a potato masher or hand mixer. Since I am mentioned in the post let me be the first to comment and review. I absolutely love this recipe and the moment it’s being baked it brings me back to my childhood and the wonderful smells of Christmas time! Tastes just like my grandmother used to make. So good.